iCloud is a type of cloud-based storage drive where users can store their files and other relevant documents across all of their devices. While the application was initially designed for Apple devices such as iPhones, iPads, and Mac devices, iCloud can now be accessed through Windows 10 and a slew of other devices. Individuals and businesses who work from a variety of locations rely on cloud storage solutions where files can easily be synced and accessed by other users. Apart from keeping a backup of their files, these drives provide a more secure and remote way for data to be stored. This cloud-based storage system is typically used to store files, thus helping free up space on computers and other iOS devices. The documents saved on the drive can now be accessed on various platforms and devices. Through this arena, users can upload their files, download, share, as well as organize and recover data. The very point of these storage solutions is to clear up space on a certain device while still having access to the necessary information just by connecting to the internet. Through this feature, loyal patrons can sync contacts, calendar entries, notes, and much more. Businesses and individuals who need more space on their computers can benefit from using this storage solution. Apart from protecting against unwanted and unexpected technical disasters, such as losing company data and information, it also ensures affordable, and cost-effective solutions while giving the flexibility and security that users need. Since the application comes for free, maintaining the files across multiple platforms is more convenient than ever. Signing up will provide users with complimentary 5-gigabyte storage on any device. While the app can be downloaded and accessed without paying exorbitant fees, increasing and upgrading the amount of storage comes with a price. A 50-gigabyte plan can be attained by paying just $0.99 a month, while a 200-gigabyte storage solution can be acquired through paying $2.99 per month. Meanwhile, users who work in a corporate setting and need more space for documents can benefit from 2-terabytes of space for only $9.99 a month. Gone are the days when Apple applications can only be opened through iOS-compatible devices. Today, iTunes and other services have become available on Windows 10. 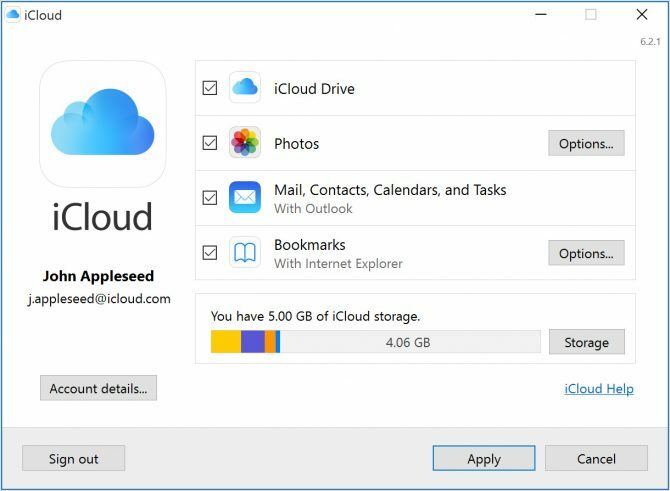 Windows PC users can now use Apple’s iCloud storage on their computers. To set this up, following the steps below are essential. The very first step is downloading the application onto the computer. Once the application has been downloaded, you must install and set up the program. After installing the program, users are advised to restart their computer. Next, open iCloud for Windows and enter credentials in order to log in. After the sign-up process, users are urged to pick the features and offerings that they intend to sync. Exploring iCloud for Windows 10 is simple with the fool-proof interface designed by Apple. After users have logged on to their accounts, they can upload and download files and photographs, as well as manage their mail and other information.